Prize team with Champion of Culture Gregory Kallenberg (center) at the 2018 Prize Fest. Gregory Kallenberg is the LEH Champion of Culture Awardee. 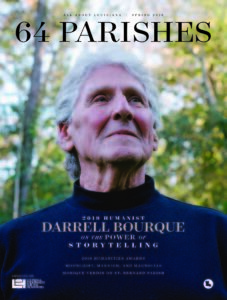 His work with Louisiana Film Prize and Prize Fest reflects the impact the humanities can have on the people and culture of Louisiana; in addition to contributing to the development of Shreveport as an arts and culture hub, the prizes and festival have generated more than $12 million dollars in positive economic impact for Northwest Louisiana. Can you tell me about the conception of Film Prize and Prize Fest? It all started with Film Prize. I’m a filmmaker by trade, and my wife and I moved here from Austin, Texas. We’re originally from the area, but we had been here making a documentary. The documentary did super well, and we got to travel the world and go to a bunch of cool festivals. The tourism bureau brought me in to help them concept out something called the Shreveport International Film Festival. When I, as a filmmaker, was looking at film festivals, I wanted to go to places like South by Southwest and Tribeca and the Maui Film Festival. Shreveport’s mountains and beaches aren’t what they could be, so we really had to think of something that was special. After a lot of tequila and late nights with the whiteboard, the idea was born: the Film Prize. Basically, it was something that’s simple, relative to making a feature, that will enable directors not only to create something that could be shown in Shreveport, but is made in Shreveport or Northwest Louisiana. It came out of my mouth: I’ll give you $50,000. The crazy thing was, at the time I didn’t have $50,000. All of a sudden these people are like, “Do you really give $50,000?” I’m like, “Yeah!” And they started to come. Competitions come and go, but the Film Prize the last seven years has given the world’s largest cash prize for a short film. All of a sudden you saw the gravitating effect of these wayward artists who really wanted to get the work done coming to Northwest Louisiana. About a thousand people each year are involved with the films that compete, and that’s led to us having over five thousand minutes of film produced for it, which adds up to the equivalent of over fifty feature films. What about Shreveport do you want to share with the people who come from afar? There was this moment in time when I was making the film Haynesville that I [realized I had] a community of people that would not allow me to fail. To see a community that is so kind in a way that when you give to it, it gives back to you. What kind of reaction do you get from folks from out of town who come to Shreveport and experience the local culture? Somebody walked up to me and said, “Hey, so you’re the guy who started this idea? Let me tell you something. I don’t know where I am, but I’m coming back.” I was like, I think that’s a win. I can point to eight people who have moved to Shreveport from other places because of the Film Prize. It’s mind-blowing. What’s ahead for Prize Fest? We are really working hard to continue to create and innovate and bring the things that are wonderful and beautiful and build a nesting place for the creative class. Right now we have Film Prize, Music Prize, Food Prize, Startup Prize, which is for entrepreneurs, we have Film Prize Junior, which is a film prize for high school students, [and] we just added Fashion Prize. My wife’s from Texas, my kids were born in Austin, but across the board, we’ve all fallen in love with this state, and we want us all to be successful. That’s the ultimate goal. Gregory Kallenberg is the founder and executive director of the Louisiana Startup, Film, Food, and Music Prizes. As of 2019, the award-winning Louisiana Film Prize has contributed over $12 million in economic development for the Shreveport / Bossier area and created a beacon to attract creative talent to Northwest Louisiana. Celebrate Gregory Kallenberg and all of the 2019 Humanities Award winners on April 4 at the Bright Lights Awards Dinner in Lafayette. For more information and tickets, visit www.leh.org/brightlights.